After 2 fairly successful sock swaps (Sockapalooza and Monkey Sock) I’ve decided to join my 3rd sock swap. This one is organized by Lynne and Emily (who just had a baby!) and is named May Day Sock Swap. This swap is a fairly small swap and is a secret swap so I wont tell you much about my pal’s preferences in case she comes and visits! I’ve already chosen the yarn for her socks but am still debating on the pattern. 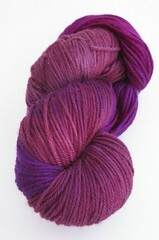 The yarn I picked is Schaefer Lola in this gorgeous purple/burgundy colorway. The pattern I’m thinking of knitting is the Red Dwarf socks by Turtlegirl. I think they’ll go together well. I’ve cast on for a practice pair of Red Dwarf socks for myself with this gorgeous yarn that is Hand Maiden Casbah in Sangria. I’m loving how it looks so far and the pattern is super fast and easy. In no time I had 2 repeats done. The Casbah is a gorgeous yarn to knit with and I’m loving the fact that I can knit it up on 3.25mm. It makes a big difference when you’re used to knitting everything on 2.5mm! For those wanting some of their own Lola or Casbah, both of them will be available at yarn4socks on the next update on Sunday 24 at 9pm est. I have some Lola in my stash – it feels like it will make really yummy socks! Both yarns are beautiful and the sock is looking great, too! Love the colors. The RDs are going to be so pretty in that yarn! Yay! ooooohhhh those are gonna be some really amazing socks. I love both the colorways you are working with. 🙂 What a lucky swap partner. I LOVE that pattern! 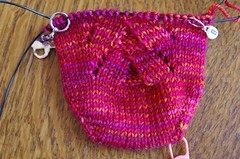 I’ve just downloaded it from Ravelry and it goes to the top of my new sock list. I think I already have some yarn at home I can use, too. Although I love how the Sangria is looking knit up. I like the Schaeffer Lola better but I think those are one-of-a-kind. If you know where I can find another, please let me know. Both of these are beautimous colors!!! The pattern looks great so far in the Casbah. 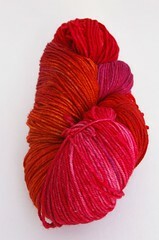 I have another question: aren’t Lola and Casbah two different weight yarns? I was checking out the Loopy Ewe and they look to me like one’s sock weight and one’s sport weight. The Casbah colors are simply luscious and I WANT some.